I am not to be trusted when it comes to chocolate. 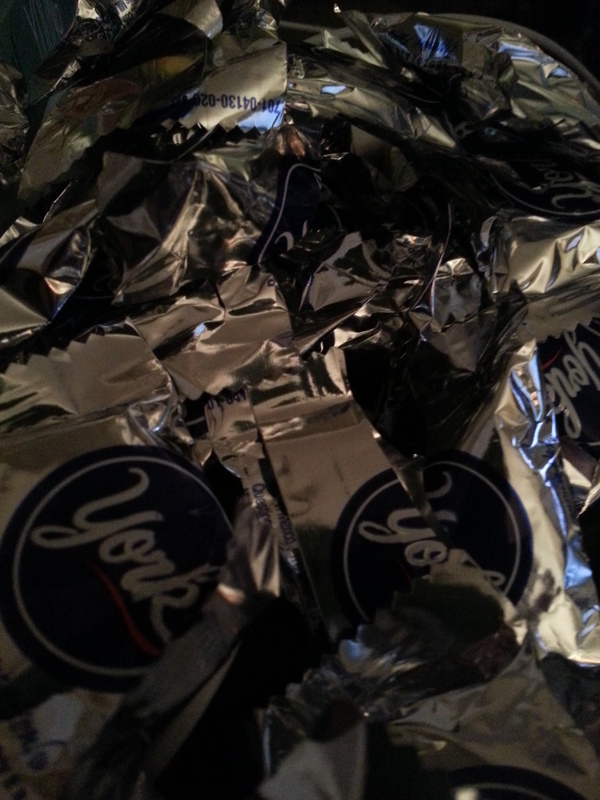 Tonight, after already eating a good sized dinner and feeling full, I ate literally the entire bag of York’s. I’m seriously embarrassed. While my chocolate bringing hasn’t even been this bad, it’s always been an issue. It’s high time it stopped. Is there some kind of Chocoholics Anonymous I can go to? (I guess it wouldn’t be anonymous if I announced my attendance online…) To be honest, I know I can’t give it up. I’ve tried. And every time, I still crave it and end up eating half the kitchen instead. When I’m feeling really determined I seem to do well rationing out chocolate chips and fun sized candies (no more than 100 calories a day), but then I lose it and just cannot stop eating. I’ll be talking more about this later, but one of my marathon goals is actually to get my weight down before official training begins. I’m able to maintain my weight even with my binging problem, but I’ll never be able to lose it. Plus it does effect (affect? anyone know?) my skin, my mood, and makes me bloated. Gradually Reducing Intake: I like this idea in theory, but it’d require me to be pretty self controlled. I don’t know if I’m there yet. Buying Smaller Quantities: This could be a good option to try out, especially since it will cost me more than buying larger quantities of chocolate and I’m all about saving money. It still may end up leading to the eating-the-whole-kitchen scenario I mentioned earlier. Setting Some Rules: This would again require some self control, but maybe a later on, after I’ve gotten a better handle on the situation, I could set up some guidelines for myself. For example, only eating chocolate when I’m with others. That way I wouldn’t be able to hide how much I’m eating and would be much less likely to over do it. Or even reinforcing my old rule – a 100 calorie per day limit. Investing in a Kitchen Safe: Yes, this actually exists! Thanks to Katie at Runs For Cookies, I discovered that this is an actual thing. You set a timer on the safe and it will only open when the timer runs out. I think this is the best option, but I’d need to convince my husband this was a good investment (they’re $50). I guess I could always put my chocolate stash in a plain ‘ol lockbox and give my husband the key. But what fun would that be? The good news about my chocolate addiction is that it does seem to subside the more active I am. I think marathon training might keep me active enough to keep my cravings at bay. Speaking of, I’ve been running again! Outside! All I needed was a some warm air and I got excited about it again. Monday afternoon I ran 3.15 miles, this morning, I squeezed in a 2.5 mile run despite some rain and large puddles. My breathing was loads better. Leads me to think that it’s caused by allergies. Allergies would be better in the morning and in the rain, right? My pace has been consistent too. About 9 minutes, 15 seconds per mile. It’ll be interesting to see if I can keep that pace on longer runs. I’d like to run the marathon in 4 hours, 30 minutes, about 10 minutes, 18 seconds per mile. Seems like a stretch now, but not impossible! It’s supposed to be really nice out tomorrow and it’s my day off so I’m planning on a long run (and allergy meds)! Who else is logging some miles in this warm(er) semi-springtime weather? Anyone have suggestions on breaking a chocolate habit? I’d love to hear!